Are roots growing in your sewer line? Roots are the number one cause of sewer back ups. 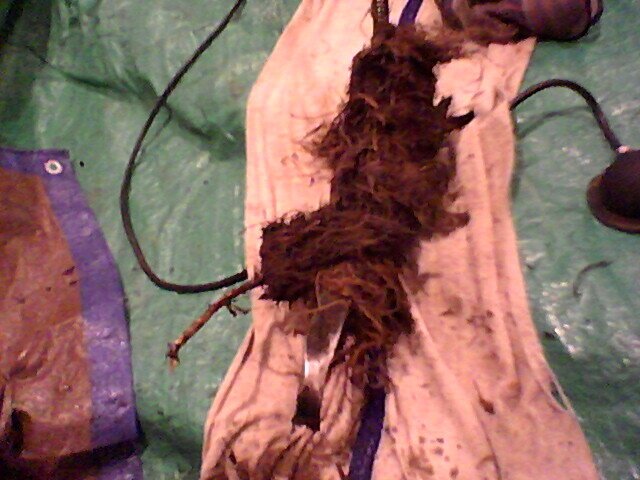 The picture above shows a cable and blade out of a sewer line with roots wrapped around. This is what we want to prevent growing faster and ruining your sewer line. Having for a clogged sewer line is never fun. Waiting to clean your sewer line until it plugs is not the right either to clean. Having your sewer line cleaned annually will benefit you most in the long run. Most every sewer line weather its made from clay, galvanized, or PVC all have roots in them. Cleaning the roots out yearly will slow down the process from you excavating your sewer line. Having a collapsed pipe is never fun to fix for any pocket book. Call Hiawatha Plumbing for all sewer cleaning, video inspecting and digging needs. Don’t get stuck with one of those high priced companies prices.